#13, 23 October 2000. Released in the UK and other unknown countries. 23 October 2000. Released in the UK and other unknown countries. October or November 2006. Released in the UK only. This is a set which combines the double CD album and the DVD, housed in a slipcase. 2 September 2016. Released in the UK and other unknown countries. 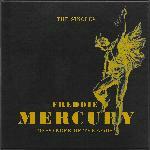 This boxed set features all of Freddie's original 12 singles, excluding reissues, plus the Larry Lurex single 'I Can Hear Music'. Each disc is pressed on 7" coloured vinyl, and housed in the original artwork. The boxed set measures 7.5" x 7.5" x 2" (19cm x 19cm x 5cm), and also contains a colour book and an MP3 download voucher.